Description: Deriving from the same family as the far more popular walnut, the butternut also has tremendous flavor and good health benefits. Growing in North America, mostly in the eastern parts of both Canada and the U.S.A, the butternut grows on trees reaching up to 65 feet in height. The trees have a somewhat short lifespan, lasting only 75 years and beginning to bear fruit at age 20. 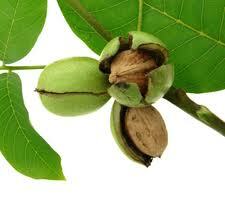 The nut requires plenty of water to grow and performs best in high altitudes. Once ripe, the outer husk protecting the seed is much easier to break off and the tree typically flowers from April to June. Butternuts can be enjoyed raw but make their biggest mark in dessert. From being used in cookies, cakes, muffins and other confectionaries, the sweet tasting butternut still makes an impact on the food scene despite being relatively unknown. In addition, the bark of the butternut tree can be mixed with sugar and turned into a syrup similarly tasting to maple syrup. Kitchen Pharmacy: Butternuts are useful in aiding digestion and are especially helpful to aid constipation. In addition, they are helpful in managing cholesterol levels and the oil extracted from the nut is often used to treat certain tapeworm and fungal infections.